Reflections and Ruminations: Nurturing a grateful heart wakes us from our slumber and reminds us that we are in God's presence. Nurturing a grateful heart wakes us from our slumber and reminds us that we are in God's presence. I was once at a food court with my plate of food before me and before heartily tucking in, made a reverent sign of the cross and thanked God for the gift of appetite and food, and proceeded to eat thereafter. I happened to share the table with a stranger, as is rather common whenever one eats alone at such places. He must have noticed what I did, causing him to ask me pointedly if my prayers before eating made the food any tastier, and whether it made any difference at all. Obviously, this stranger wasn’t a believer in God or in ritual, but I wasn’t quite ready at that point in my life to engage with him in any form of spiritual discourse. I was only barely twenty at that time, long before I became a priest. Why do we pray before eating? Why do we pray upon waking in the morning? Why do we pray at all? Routine in life can often end up making us unthinking automatons but it really should not, especially where our faith life is concerned. Knowing why we do what we do makes us aware of our existence and of life’s purpose, which for us believers has to be about glorifying God and becoming his images in which we are made. Most of the time, however, we find ourselves wrapped up within our own little world, and find ourselves having hearts that are too small and loving in ways that are narrow and limited. One of the very common things that many Catholics seem to struggle with is the love of God. Whenever people tell me (oftentimes in the confessional) that they have not said their prayers, or have missed Mass, my response is to ask them why they pray at all. Hardly have I ever received the answer that they pray because they love God. If we only pray in order to get God’s attention, or to get him to answer our requests and needs, or only in response to having had received what we had asked for, perhaps we have yet to realise that prayer should first and foremost be predicated on our love for God. Let me state that it is not wrong to ask God for our needs to be met in prayer. But if that is the predominant reason we seek God and want to communicate with him, our relationship with him may be far from mature and life giving. Jesuit writer Paul Coutinho wrote with much insight on one paradigm of prayer, which sees one making the movement from talking to silence. He says that there are four stages here. The first sees us talking to God and believing that he listens to us. At this stage, we are confident that we can bring all our needs to God, and that it is he alone who can provide for us what our loved ones are unable to. At this stage, we talk and God listens. The second stage is when we listen to God, and behave like young Samuel as we say, “Speak, Lord, your servant is listening.” At this stage, we are keen to carry out what is willed for us by God, and where we can change and become stronger in faith and overcome our weaknesses. At this stage, God talks and we listen. Then comes the third stage where because we are in a relationship, both God and we are doing the listening. There is little use of words that feature in prayer, and neither is there much requests made. Heart begins to speak to heart in presence. One can compare this to how lovers find words superfluous and in the silence of each other’s presence, one tries to anticipate what the other is saying without words. The final stage in this paradigm of prayer is where no one talks and no one listens. Here, both perceive a silence that does not have any agenda at all, neither in listening nor asking. One just is in the other’s presence and one is in a direct union with the Divine. Obstacles are non-existent, and one is enveloped by God. It is rare that we experience this in our prayer life, and I believe this is a mystical experience. Scriptural representations of these are like Mary being overshadowed by the Holy Spirit in her life, and Moses being drawn and enveloped by the cloud and transformed, emerging from it with a brilliance emitting from within him. When our prayer life is not predicated on our love of God, we will easily find ourselves loathe to pray. It is only natural to avoid what we find a chore and a duty. But if we see that our rationale for praying really has to come from our loving God, we will attach to it less and less any idea of obligation or a task. If lovers find loving a chore, in no time will they stop being lovers. I began this blog, recalling that incident at the food court. I still do pray before my meals, and I can say that it does stem from my love of God. I am put in a state of awareness that it is the love of God for me that he makes all things possible, and this includes nourishment for my body and spirit. As to whether my food becomes any tastier, it really doesn’t. I remember that in my convalescence while undergoing chemotherapy, nothing I ate was delicious and I went on for prolonged periods when my appetite was hardly there. I still prayed before meals. It never made my meals enticing, but it definitely made me more grateful for everything before me in life. 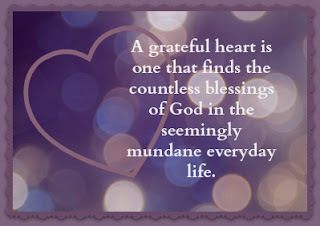 The words "nurturing a grateful heart" puts me in mind of our time in Mission School when after Recess - the sister-nun in charge would shh-ed us children to silence & told us to say a silent thank you to Jesus with our hearts – for the food we had just taken! I guess that's nurturing gratefulness of the heart....and the nuns do believe in starting young! Of course, those were gentler & more indolent times and we were more obedient and naive. For the benefits of giving thanks are many. One of which - I feel -is a renewed sense of humility knowing where I am today through His grace. Or as you said...."it wakes us from our slumber and reminds us that we are in His presence"...it makes us aware that the God of our salvation is very near .......in fact, within us....and therefore we will be more mindful of our words and actions. There is thus, a quiet joy of living that comes from a heart of thanksgiving. So we don't need to wait for anything tangible that we have received to thank him - as each day itself is a blessing, a gift received. We just need to have this proper attitude to receive it well, to cherish & delight in it and in appreciation share it with others! Thank you. The Holy Spirit spoke being enveloped to me. Your words here helped me to further meditate on His heart for me. God bless you and may He continue to use your Words to draw others into Him.